The 4th Annual Achieving the Dream Retreat was held on May 29, 2015 at Los Angeles City College. 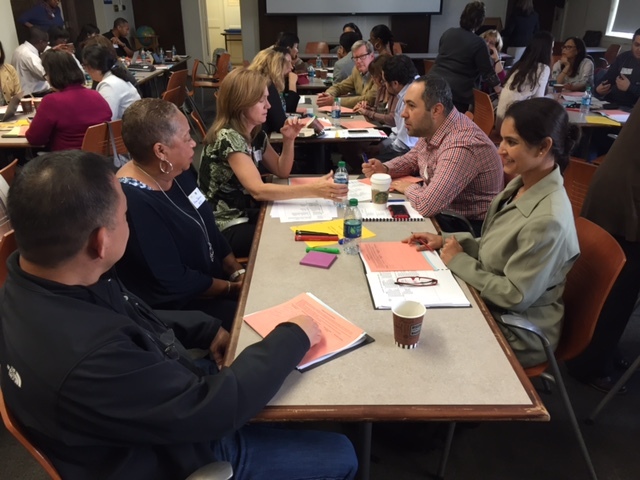 There were 48 participants, including three AtD coaches present. We reviewed the four AtD goals from this past year, including survey data regarding these programs/plans: First Year Experience Programs, Assessment/Placement, Developmental Educational Pathways, and Culturally Responsive Teaching and Learning. Participants also discussed the integrated plans for BSI, SSSP, Equity, and AtD. These initiatives have convergent goals that were discussed and later used in our brainstorming for our AtD goals for next year, which include professional learning, welcome centers, and student persistence among others. Please join us on June 26th at our next SSI Meeting from 10am-12pm at the LACCD Board Room. We will be discussing our AtD goals and begin planning our summits for the next academic year. We encourage you to use the worksheets posted and if you would like assistance in facilitating these conversations on campus, please let us know and we can host a professional learning event on your campus.